I totally fell for a great art of storytelling. The real story is very different from my story below. Another post on Pulse explains it well. What I’ve learned is to to even better research before writing a post. But the question remains: What does this mean for an organization if it were true? A connection on LinkedIn liked this picture. I liked it as well, but I couldn’t quite make sense out of it. 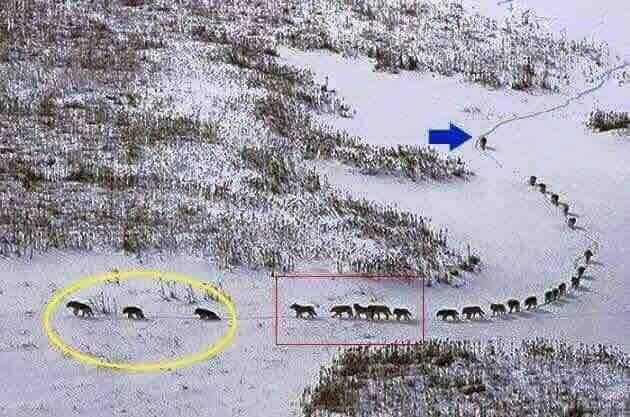 Probably, the leader of the pack would be walking in the back (with the blue arrow). What about the 3 wolves in the front (yellow circle) and the five (red rectangle) behind them? There’s a helpful tool on google and it’s called “Google Image reverse Search” and you can find the original webpage(s) of an image. I uploaded the picture of the wolves and found many websites in Spanish and French. The first three wolves are the old or the most sick wolves. They define the rhythm and the pace of the group. If this was not the case, they would fall behind and would be easily attacked and sacrificed. They are followed by five strong and powerful wolves, the rest of the pack and another five strong wolves (green square). The last wolf, way in the back, is the alpha male. He is the leader of the pack. From his position he controls the pack, decides on the direction to go and anticipates on enemy attacks. The pack advances by the rhythm and speed of the old wolves under command of their leader in the mutual understanding to leave no one behind. How does this reflect on your organization? How does your team advance towards its goals, success, fulfillment, growth or survival? You know that’s fake, right? Thank you for your comment! Yes, I am aware that ths is fake and therefore I altered the intro of this Blog. The questions remains…How would this reflect on your organization? How does your team advance towards its goals, success, fulfillment, growth or survival?